Maybach Zeppelin: a car for millionaires | What Car? 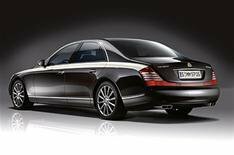 The folks at Maybach must think there are still plenty of the super-rich out there, because they've just unveiled new versions of the 57 and 62 limousines. The new Maybach Zeppelin models get a tweaked 6.0-litre twin-turbo V12, which develops 631bhp and 737lb ft of pulling power. That's 28bhp more than the standard car, should you be comparing such figures with fellow fat cats. Other tweaks include aerodynamic wing mirrors, lambskin carpets, diamond-quilted cushions and a partition screen, so you don't have to socialise with the chauffeur. Buyers of the 62 also get Zeppelin-inscribed Champagne flutes. There's also the option of a Citroen C4-apeing perfume atomiser, which owners can fill with their favourite fragrance, then dispense it at the push of a button all for an extra 3500. The Maybach Zeppelin goes on sale in March 2009. German prices start at 365,000 for the 57 and 425,000 for the 62.